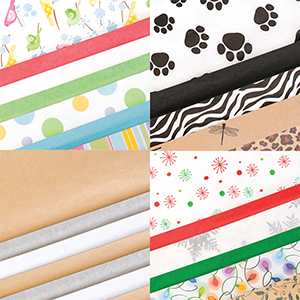 Popular Pack: 480 sheets of 24 sheets comprised of 20 colors including: Black, Buttercup, Cabernet, Cerise, Citrus Green, Dark Pink, Evergreen, French Vanilla, Holiday Green, Lavender, Light Blue, Mandarin Red, Orange, Parade Blue, Tan, Turquoise, Yellow, and White. Spring Pack: 480 sheets of 96 sheets of 5 spring colors including: Lavender, Light Blue, Light Pink, Peach, and Yellow. Holiday Pack: 480 sheets comprised of 144 sheets Scarlet Red and Holiday Green, plus 192 sheets of White. Complete Pack: 1680 sheets of 24 sheets of each solid color along with white and recycled kraft. Random Solid Assortment Pack*: 400 sheets, 20" x 26" random assortment of solid colors. Sheets are 20" x 30", unless otherwise noted. Order Printed Tissue by the package. Package sizes are as indicated. Still looking for more tissue; take a look at our Printed Tissue Assortments.